This is my current wallpaper right now. 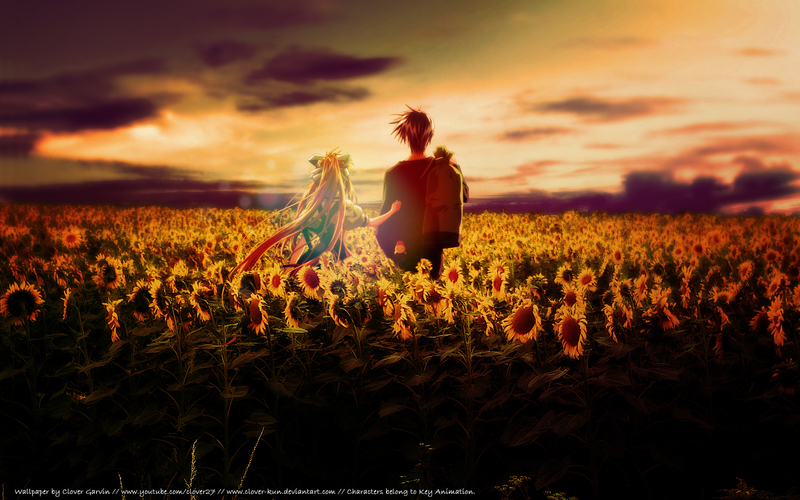 Sunflowers always seem to remind me of this anime, so I decided to do something with sunflowers. I experimented with a lot of different scans of Misuzo before chosing this one. I knew I didn't want her to face me. I wanted her to look at the horizon, far away, as if my screen was an endless sunflower field. I was also wondering wether or not I should leave Yukito there, but due to the lack of Misuzu/Yukito wallpapers out there, I decided to leave him be, and now I'm happy I did, because I don't think this would have the same feeling if he weren't there. The sunflower field is a stock I borrowed from here and the sky is from here. So beautiful! The light is so warm, great job. Your great.........Yeah its Great! I like it! ke tierno son tan lindoss! I love this scene a lot. Thanks for sharing.